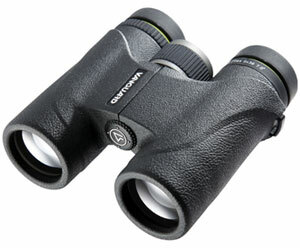 The Vortex Fury binocular has been discontinued by the manufacturer. We feel this is an excellent replacement for a binocular that was very popular. A best buy. The Vortex Fury is one of the least expensive models in the survey, but it has good (4.0) optical resolution, excellent ergonomics, a wide 412-foot field of view, and close focus down to 4.9 feet. The diopter setting, behind the focus knob, is easy to see and adjust, with a scale and micro-click adjustments. With 16mm eye relief, it works well with glasses. A birder could be very happy with this binocular. Pro: Good optical quality at low price, perhaps the best value in the study; glasses friendly. Con: The diopter adjustment doesn't lock.